Moving is stressful. There are boxes to gather, utilities to shut off and turn on, people to notify. But the part of moving that keep me up at night is the question of where I’ll get my bagels. It’s not so much that I care about bagels, but that I no longer know where anything is. In my current neighborhood, I know the location of every ATM. I know who makes the best latte. And I know which bars have the best happy hours. In the new neighborhood I’ll be starting from scratch. In both services you can type a general address (or just a zip code) into the search bar along with a type of business. Google immediately shows you a map with all the matching results. Yahoo, on the other hand, defaults to a simple list view and makes you click on the View Results On Map button to get a visual of area. In both cases, however, clicking on the mapped markers brings up more information about the establishment, including a link for directions. 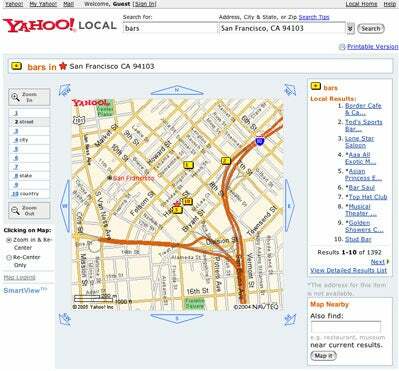 Yahoo offers an additional feature that lets you map the results from a second search on top of the results from your first search. So, for example, if you need to go to the ATM before you hit the movies, you can do a search for movie theaters and then find ATMs near the movie theaters all on the same map. It’s a slick way of finding your way around almost any neighborhood. The frustrating thing, though, is that the two sites give vastly different information. It’s a bit like asking strangers for the nearest gas station—you’re always going to get a different answer. So far I haven’t found a clear winner between the two. 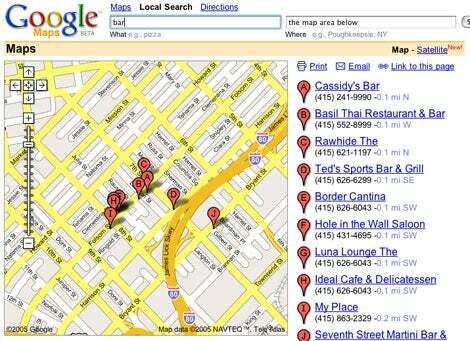 For example, Google gave me better results for local bars, while Yahoo gave me better results for ATMs. And both were noticeably out of date. Still, the results are pretty impressive. 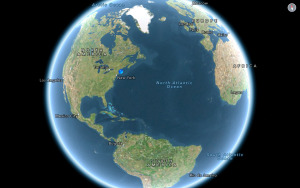 I prefer Google’s map—it gives you more control over how far you want to zoom, and frankly, just looks prettier. You can click and drag the map to reposition your view. Google also lets you click on a Satellite link to see what the area looks like from above (or at least what it looked like in the late 1990’s).